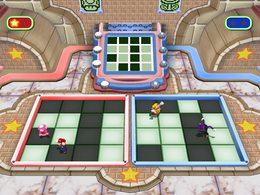 Pixel Perfect is a 2-vs.-2 minigame in Mario Party 6. Its name comes from the term, "pixel perfect". The camera zooms in on the display on the top of the screen. It then scrolls through a picture of a Star, Mushroom, or Fire Flower and stops on one of them. There is a large black and white grid at the top of the screen that forms a picture. The two teams have to race each other in copying the picture by Ground Pounding different panels to turn them black or white and match the part of the picture. Players must also be careful not to accidentally ground pound their partners, or they are temporarily squished flat and unable to move. The first team to copy two pictures wins. The display above prints out the complete sprite shown on the screen. The winners and losers then perform their corresponding animations. Rules – "Ground-pound floor panels to change their color and make them match the example. The team that scores two points first wins!" Advice – "Study the example closely to figure out which panels need to be changed." The images shown at the beginning are the Super Mushroom, Starman, and Fire Flower sprites from Super Mario Bros. 3. This page was last edited on January 27, 2019, at 20:45.